Considering moving to the cloud? Check out IBM’s no-risk offer. The program offers confidence to venture into the cloud, knowing that a return path is available should conditions change. You won’t lose any of the world-class TM1 functionality you have implemented. And, in fact, you’ll gain all the added benefits of IBM’s TM1 SaaS application – IBM Planning Analytics, without the hassle of having to manage the on-premise application. Locus Solutions has helped customers successfully deploy to the cloud – and we can help you be successful too. We will begin with a no-obligation assessment to determine if you’re eligible for IBM’s incentives, your migration path requirements, confirm the new feature benefits that matter most, and understand the time and resource savings the cloud may provide you. 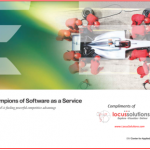 We will make it easy for you starting with the “Champions of Software as a Service – How SaaS is fueling powerful competitive advantage” report – compliments of Locus Solutions.